This U.S. Mint numismatic sales report covers the week ending May 27, 2018. The Mint’s best-selling product this week was the 2018 American Silver Eagle one-ounce Uncirculated coin (18EG), which is a new item on the report. Released on May 24, it sold 89,482 units during its three days of availability before the close of the reporting period. In second place is the 2017 American Silver Eagle one-ounce Uncirculated coin (17EG), with 22,196 units sold, jumping up from fourth place last week. The third best-selling item this week was the 2018 U.S. Mint Uncirculated Coin Set (18RJ), with 5,852 sold, which was the Mint’s top-selling product last week, having been newly released that week as well. 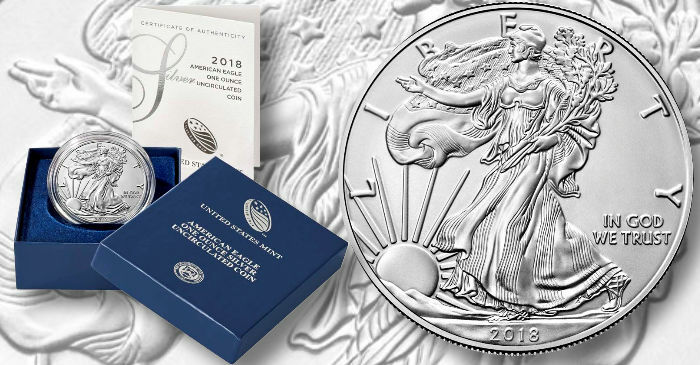 It’s followed by the 2018 U.S. Mint Proof Set (18RG), with 5,403 individual units sold; and the 2018 American Silver Eagle one-ounce Proof coin (18EA), with 2,292 sold, the former of which was second last week in sales while the latter maintained its spot. The week also saw a considerable downward adjustment in sales directed at the 2018 U.S. Mint Silver Proof Set (18RH). The net sales figure of 168,789 silver Proof sets reflected a massive downward adjustment of -10,786 from the previous week. The 2018 World War I Silver $1 Proof Coin & Medal Sets saw fewer downward adjustments than last week (just -27 overall) and are still marked “currently unavailable” on the Mint’s website. Those still interested in acquiring one or more sets, and who aren’t worried about whether they could grade at 69 or 70, should sign up for the Mint’s e-mail notifications to learn whether the Mint will resume sales of these products once all returns have been processed. There are no new products scheduled to be released by the time of next week’s sales report. The following are the U.S. Mint’s cumulative sales figures for the reporting period ending Sunday, May 27. “LKS” indicates that the number given is the last known sales figure for a sold-out item. Mintage and product limits are indicated, where applicable; if a coin is in stock but is nearing sold-out status, a link to the Mint’s product page is provided. Items in italics either are scheduled for release or have been released too recently to appear on the report; items in bold are appearing on the report for the first time.